Sometimes I wonder why I keep getting new cameras - with each one, I feel like I take a massive step backwards as I have to relearn each camera - it's quirks, its manual settings and well, everything about it and then apply all that I've learnt into taking the photos that I want to take. And my refurbished LC-A is proving to have a very steep learning curve... but here are some of the better results from Roll 2 - I think the one of me is probably the best and I didn't even take it, haha. 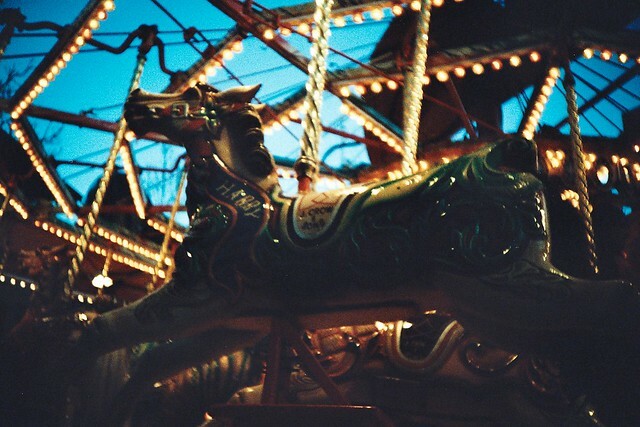 The first two photos are from the Lomography Xmas meet up and the rest were taken in Minehead. The great thing about testing this camera is that as it has a light meter, I can try photos inside and also when its a bit grim or dark outside - the chandelier and the carousel in particular, I never would have taken with my other cameras, as I know their restrictions... but this camera has amazing potential for variety which I'm really looking forward to exploring more.